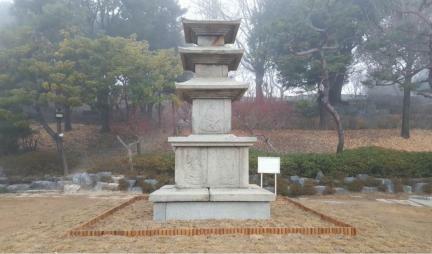 범허사라고 전하는 경상남도 산청의 옛 절터에 무너져 있던 것을 1941년경 대구의 일본인 골동상이 구입하여 공장에 세워 놓았으나, 1947년 경복궁으로 이전되었으며 현재는 국립진주박물관에 보관되어 있다. 탑은 2단의 기단(基壇) 위에 3층의 탑신(塔身)을 올린 일반적인 모습이다. 바닥돌과 기단의 아래부분은 옮겨 세울 당시 시멘트로 보강한 탓에 원래의 구조는 알 수 없다. 기단의 네 모서리와 각 면의 가운데에는 기둥을 본떠 새겼는데, 아래층의 가운데기둥은 2개씩, 위층은 1개씩을 두었다. 특히 위층 기단에는 가운데기둥으로 나누어진 각 면에 8부중상(八部衆像)을 도드라지게 새겨 놓았다. 탑신부는 1층 몸돌에 보살상의 모습을 1구씩 조각해 우아한 모습을 보여주고 있다. 지붕돌은 밑면의 받침이 4단씩이며 각 경사면은 평평하고 얇은 모습이다. 또한 추녀 끝의 치켜올려진 정도가 날카로워 경쾌한 인상을 보여준다. 이 탑은 기단과 탑신의 1층 몸돌에 8부신중 및 보살상이 화려하게 조각되어 있어 ‘장식탑’이라 일컬어지기도 한다. 이러한 장식적인 조각표현으로 인해 장중하고 소박한 맛을 잃기는 하였으나, 전체적으로 통일신라 후기 석탑의 특징을 잘 나타내주는 우수한 작품이다. 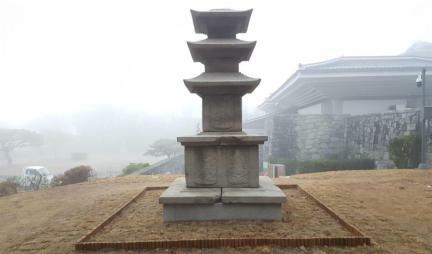 Originally a ruined pile of stones located at the site of an old temple named Beomheosa in Sancheong, Gyeongsangnam-do, this stone pagoda was purchased by a Japanese antique dealer in 1941 and rebuilt at a factory yard in Daegu. 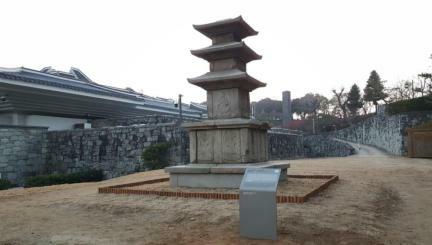 The pagoda was moved to Gyeongbokgung Palace in Seoul in 1947 and then to the Jinju National Museum where it stands today. 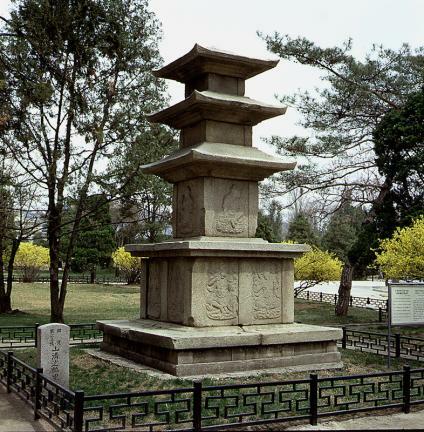 The pagoda exhibits the typical appearance of the Korean three-story stone pagodas with the double-tier base on which a three-story structure is erected. The foundation has lost the original structure due to the cement used to reinforce the structure at the time of rebuilding. 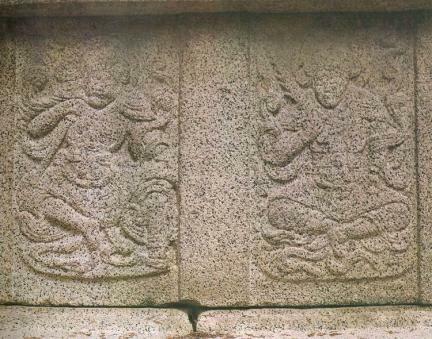 Each tier of the base has four corner columns, two (lower tier) and one (upper tier) central columns, all carved in relief. There are the Eight Guardian Deities, two on each of the four sides, carved in relief and, on the first-story body, four bodhisattvas, one on each side. Each of the three roofstones features four-tier cornice, thin and gentle slopes, and delightfully upturned corners. 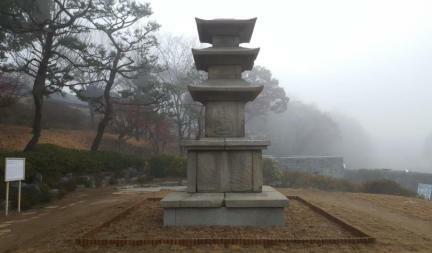 The pagoda is also dubbed “decorative pagoda” largely because the elaborate carvings of Palbujungsang, i.e. the eight guardian deities of Buddhist law around the upper tier of the base and the first-story body. 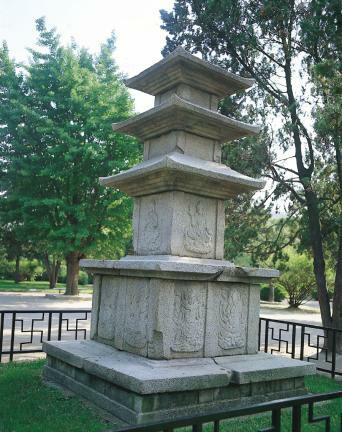 Some experts point out that the rather excessive decorative carvings rid the pagoda of the majestic simple appearance that characterizes the pagodas of its kind, but believe that it is a fine example of the stone pagodas of late Unified Silla.